The island of the gods, Bali, can get a bad rep sometimes which means deciding where to stay will define how much you love (or hate) this beautiful island. 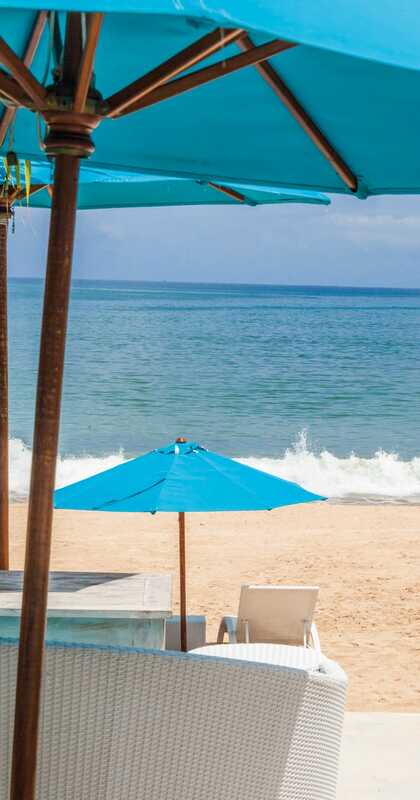 Jimbaran Bay, the golden stretch of sand to your right as you come into land offers a slower and more authentic pace of life than hectic Kuta to the left. If you want to get a taste of island paradise without the hassle then this could be the right spot for you. 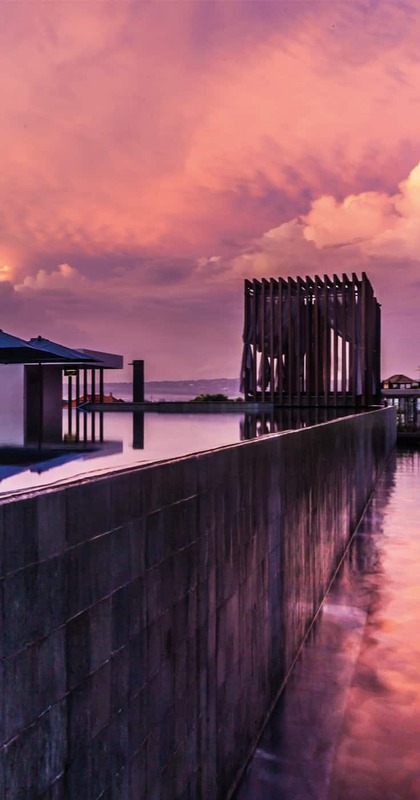 The one thing that can put people off this area is the price but this great new hotel in Jimbaran could be the perfect answer. 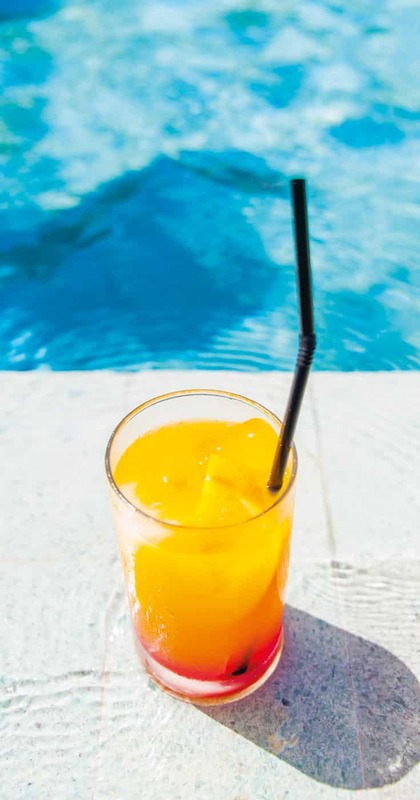 With stylish cocktail bars, rooftop pools, spa and a beach club on offer, you can get your slice of affordable luxury without breaking the bank. 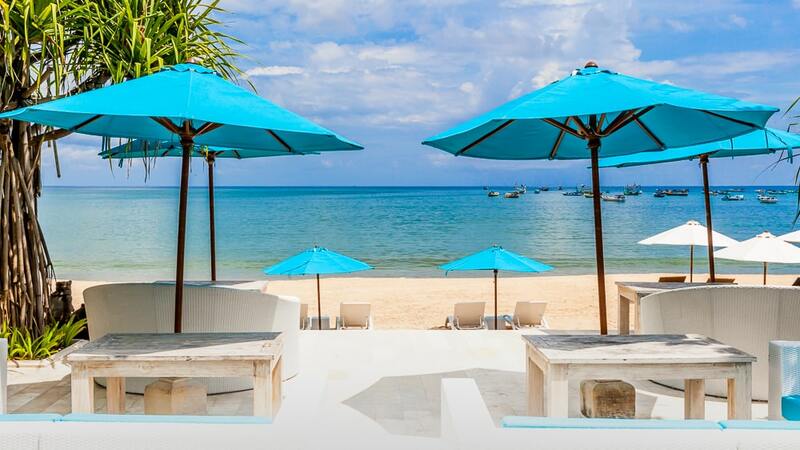 Could this be your ideal base to explore Bali? Jimbaran is one of the three areas that makes up the ‘Bukit’, the sticky out area at the bottom of Bali. The beach is a beautiful stretch of golden sand. Cleaner and quieter than its counterpart in Kuta it’s a great spot to catch some rays, eat fresh fish or chill out at a candlelit bar in the evening. 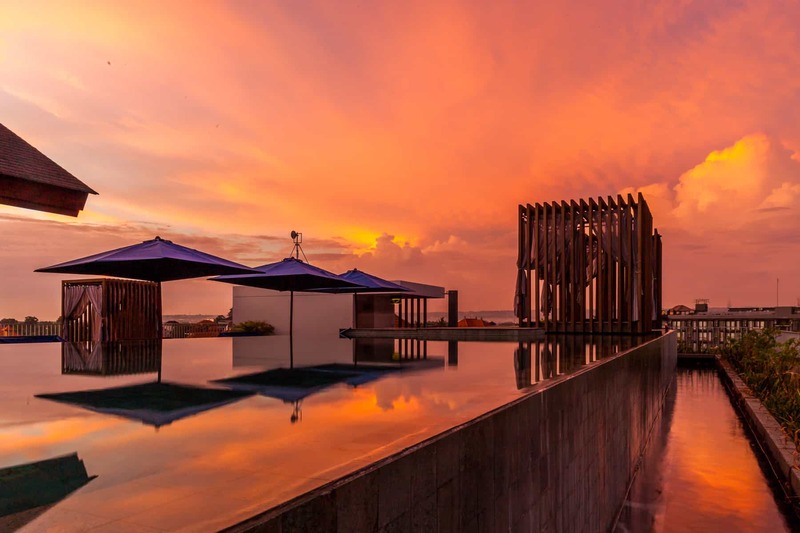 The sunsets that Bali is famous for are perfect from here, catch the last of the rays hiding behind the rock and if you want a real treat head to the beach to Sundara beach club for an insanely good (and pricey!) Spiced Negroni to go with it whilst enjoying their beachside pool. 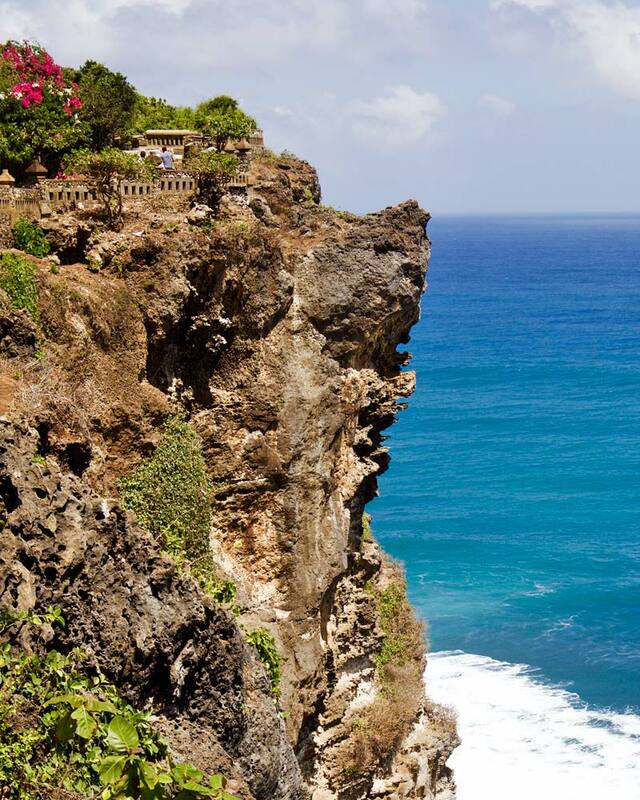 Uluwatu Temple is one of the most stunning and famous sights in the Bukit. Perched above the crashing waves on a cliff and home to heaps of Monkeys you can either explore it by day or catch the sunset and local dancing here by evening. See further down for more suggestions on day trips. 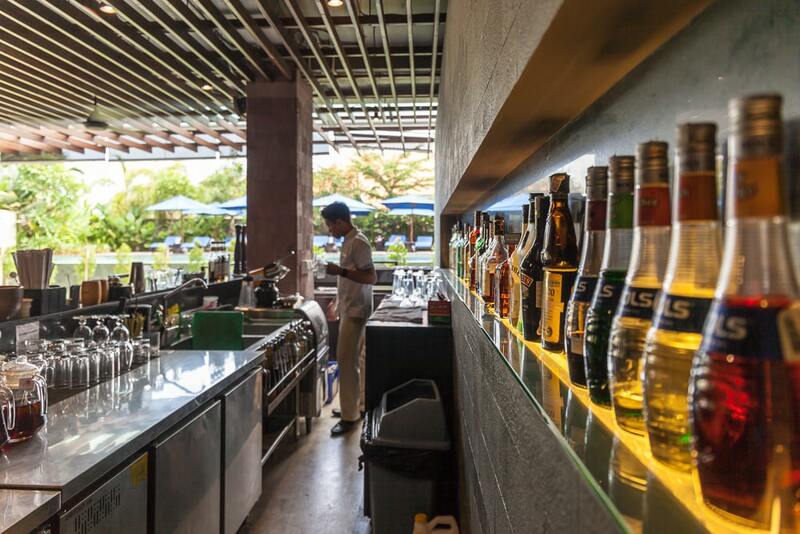 The nightlife in Jimbaran might not be as loud and in your face as it’s neighbours but if chic beach bars are your thing then you are in luck. Check out some great recommendations here. The rooms at the Watermark Hotel are even better than many five star hotels I have stayed at on the Island. Although they are more modern than traditional, the use of dark wood on the walls and big stone bath tubs blend nature with contemporary features such as Nespresso machines and high tech lighting/sound systems. The Club Suites on the ground floor all come with their own private pools, so who cares about the bath tubs right? The suites on the higher floors have balconies and were my personal favourite as the big spacious rooms are filled with light. 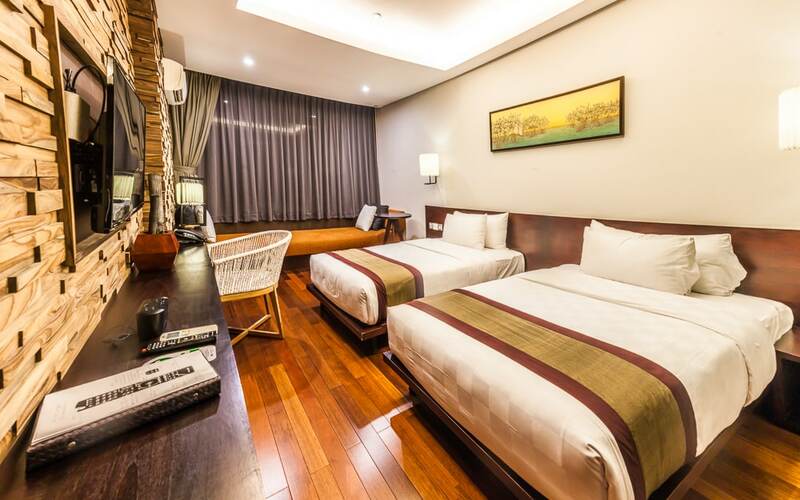 The standard rooms also have heaps of space and a lounge area for relaxing in. 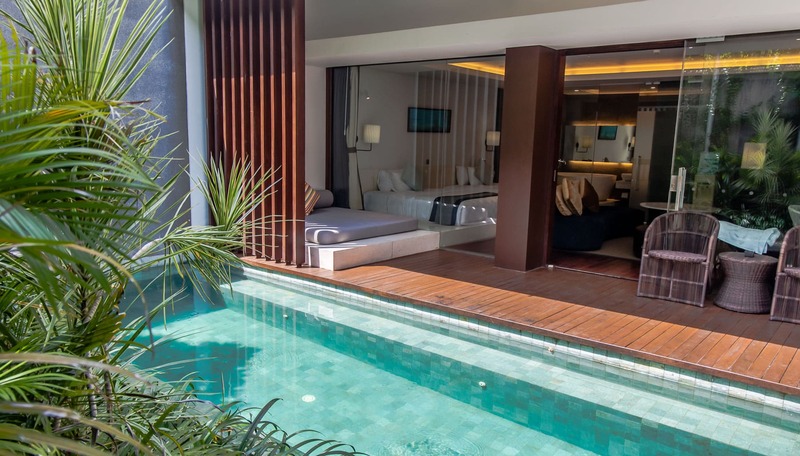 With two pools relaxing isn’t a struggle here and the addition of the in-house Liang Spa makes it easy to chill out to the max. 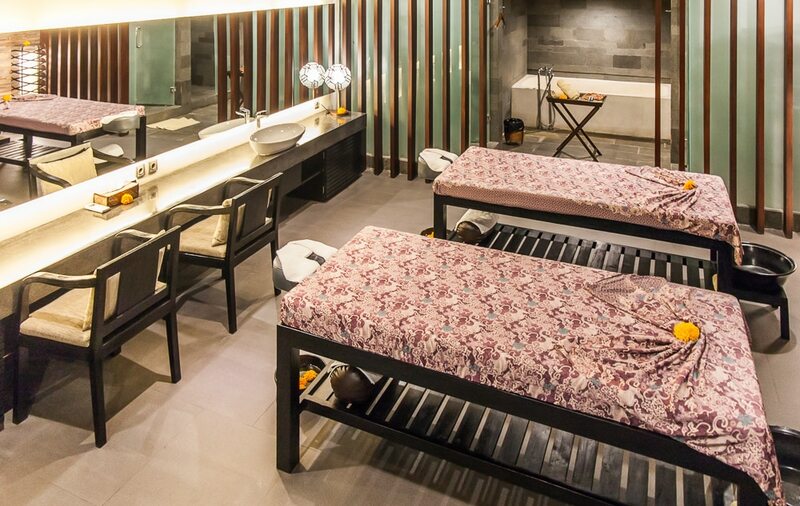 I’ve got to admit I’m not a spa kinda guy so skipped it myself but the 9 spacious rooms complete with luxury baths and treatments are gonna impress anyone after a pamper. When you are ready to venture out of the hotel you can jump on the shuttle for the few minute transfer to the beach club. It’s small, with a handful of loungers and deckchairs and an attached restaurant but hey, you have a long stretch of sand right there with the warm water at your feet to enjoy. A small but complete gym is also onsite though the views from the treadmill looking down on to the pool meant taking a dip usually won for me. Got Kids and need a break? Let them enjoy the paddling pool as you swim in the main one or they can entertain themselves in the soft play room full of toys and ball pool. Eating and drinking at the Watermark are covered with three restaurants and an additional rooftop bar for sunset cocktails. 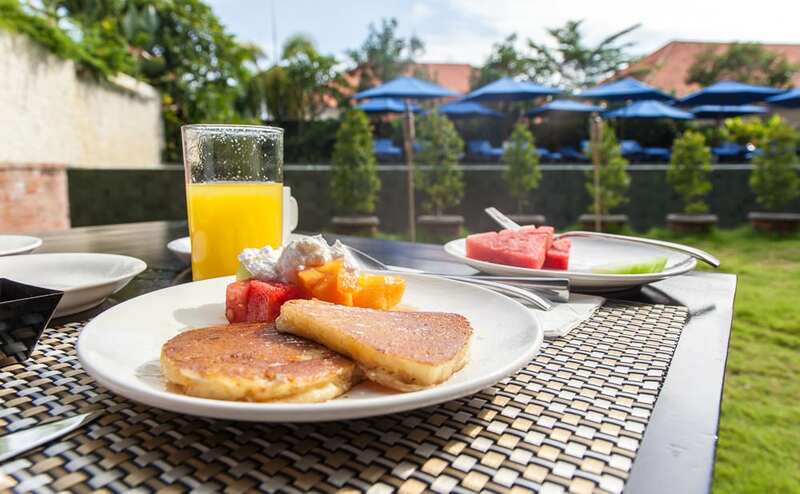 Grab the breakfast buffet at W Senses restaurant, Japanese at Imadoki or a quick bite in the Angelique cafe. 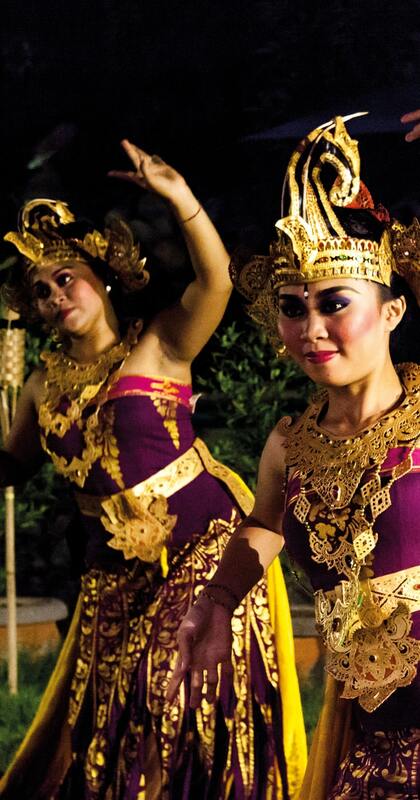 Once a week they also host a dinner with traditional Balinese dancing. The local area has heaps of small Warungs to dine from so there is no struggle to get closer to traditional Balinese cuisine. If you are staying in the Club suites you can also access the premier lounge all day long which serves up complimentary drinks and canapés between 5-6pm each night. Even after check out their is a dedicated departure lounge with comfy sofas, that needed aircon and plug sockets to keep your gear charged before taking the flight back. Bali is not the biggest of Islands but unless you are hiring a scooter (around 80k IDR a day) you are likely to get stuck in traffic. The hotel can arrange transport for you or alternatively the Blue Bird taxis are reliable and work on a meter. Uber has arrived in Bali but is banned from serving certain areas. Kuta & Seminyak are the busiest tourist destinations on the Island, great bets for nightlife they are a short taxi hop away from the hotel. 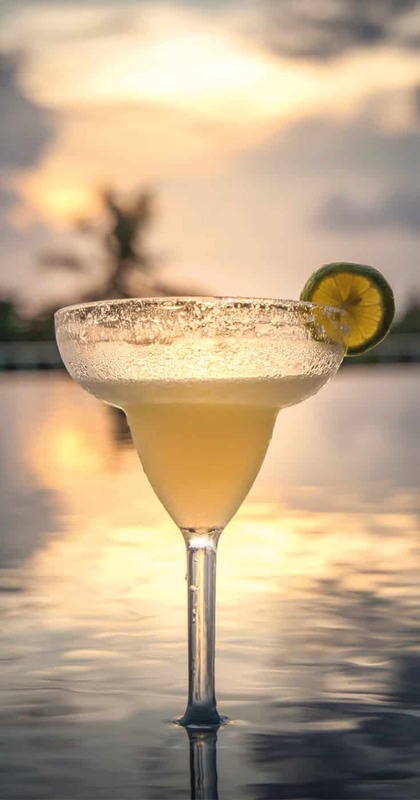 Grab some great Italian eats at Ultimo restaurant before beers and dancing at La Favela or visiting the famous Potato Head beach club for sunset. 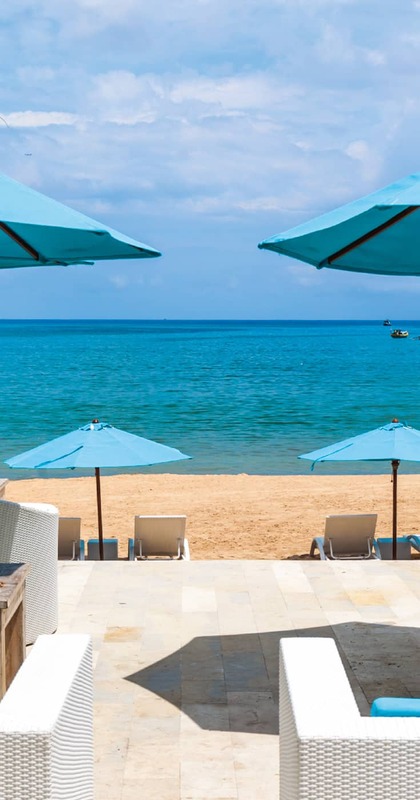 Nusa Dua is home to shopping centres, stunning beaches and the gated development of the BTDC full of luxury hotels and is a great day out to get some different beaches or catch some surfer at Geger. 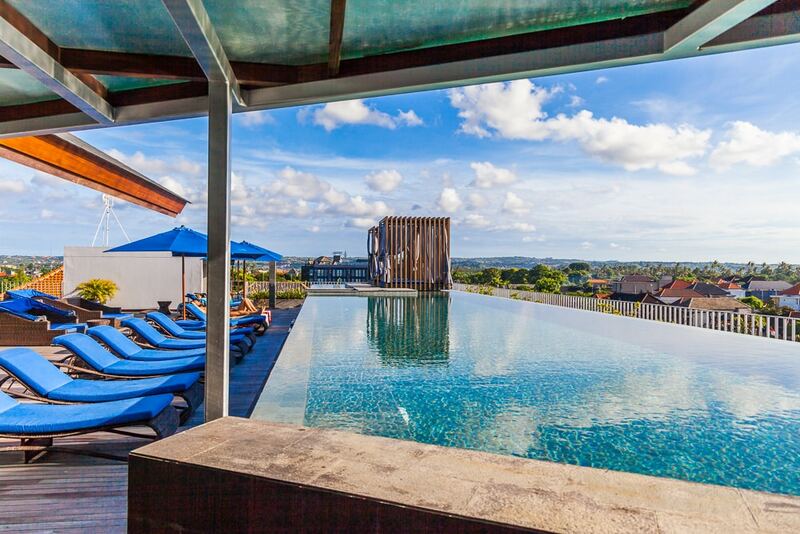 Ubud is the ‘spiritual’ capital of Bali and a top place to visit for the day. 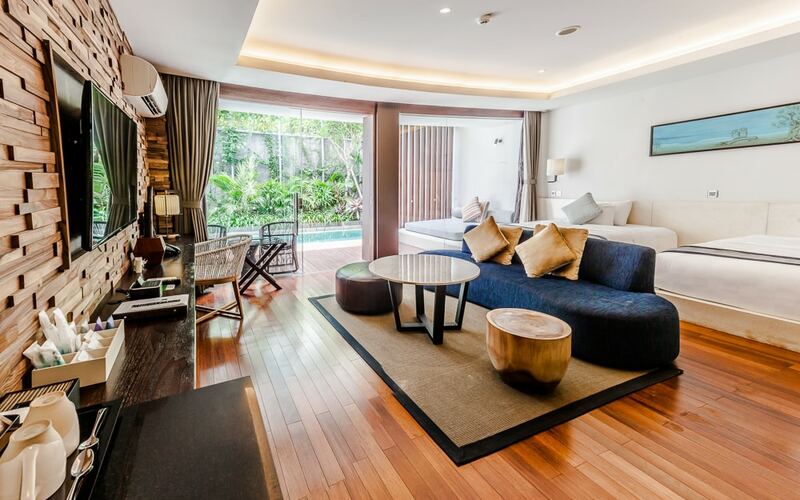 See the rice terraces, hit up the monkey forest, take a yoga session or grab a cooking class. 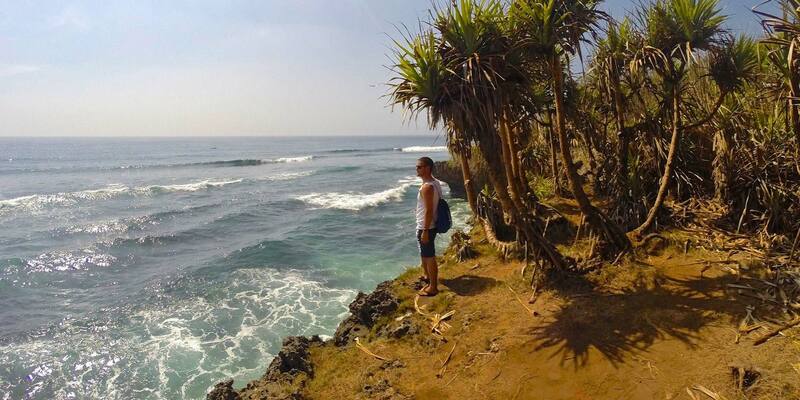 Further Afield Bali has so many awesome spots to visit on the mainland which can make great day trips including trekking Mount Batur, diving the Liberty Wreck near the black beaches of Amed or hitting the rice fields of Canggu before catching the sunset at the famous Tanah Lot. 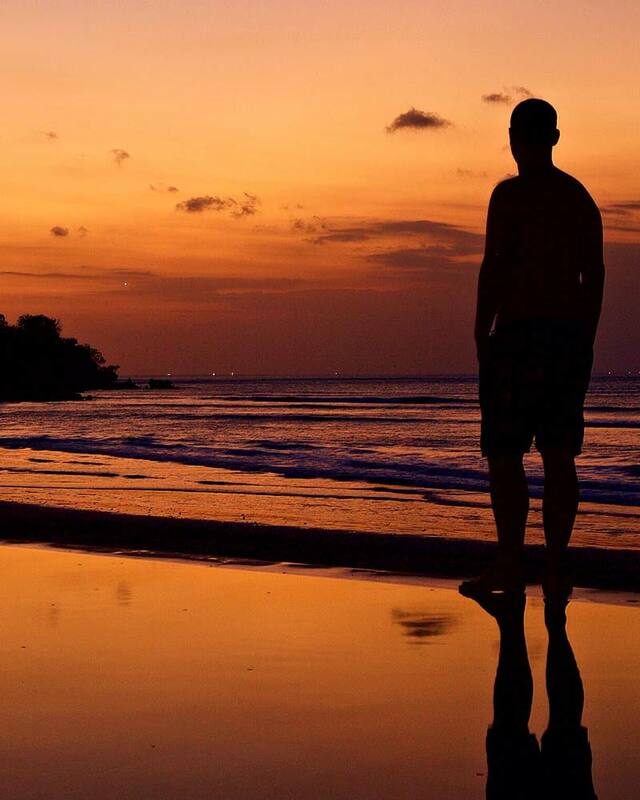 Alternatively, you might want to extend your trip for a few days to visit The Gili Islands. Getting there from the airport to the hotel is a 15 minutes taxi drive and being close to the bypass makes it super easy to get around. What’s the cost? Standard rooms start at $60+ and $100+ for the suites, with the private pool suites starting from $220+. 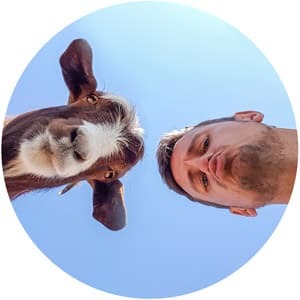 There is a wide selection of offers on their website, from honeymoon through to a quirky birthday % discount idea as well as a mega 50% discount for advance purchasing right now. Want to book? 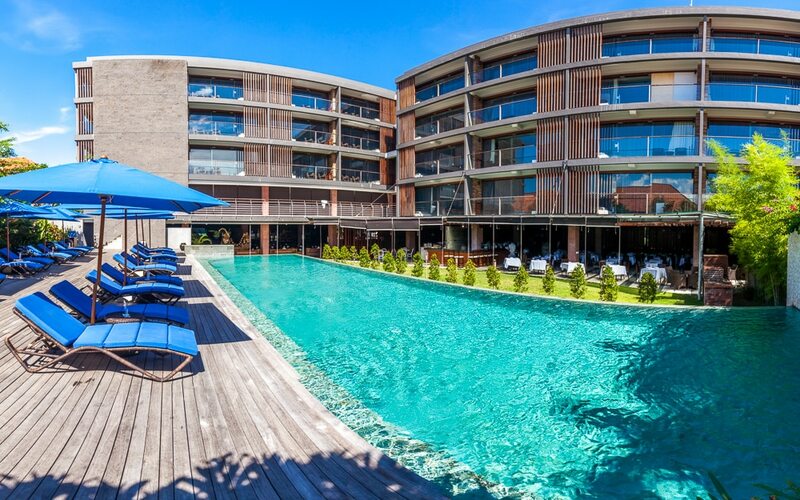 Head over to the Watermark Hotel & Spa. My time at the Watermark was as a guest, however, all opinions are my own – trust me, I’m not a big fan of hotel reviews so if I do one then they must have won me over. Do you know how far this is to walk to the beach. Is it close enough you don’t have to use the buggy? Maybe 5/10 minutes if you are taking it slow down a side alley – not far at all.